The brown hawk-owl (Ninox scutulata) belongs to the family of owlets and owls, the Strigidae. The brown hawk-owl species is distributed in Indian subcontinent, southeast Asia, China and Hong Kong. These hawk-owl species are undergoing decline due to ecosystem degradation and conversion. These hawk-owls are polytypic species. The brown hawk-owl (Ninox scutulata) is a medium-sized hawk-owl, measuring 25 to 35 cm in length and weighing 170 to 220 grams. These hawk-owl species have dark brown round head. The lack of ear tufts gives them hawk-like appearance. The facial disc is not distinct. There is a whitish patch on the forehead. They have brownish upperparts and a long barred tail. The underparts of the hawk-owl are whitish with bold reddish brown streaks and blotches. The undertail is pale gray with darker bars. The undertail coverts are white. The bill is small and pale gray. The irises are bright yellow. The legs and feet are yellowish. The call of these hawk-owl species is a repeated mellow, hooting "whoo-wup..whoo-wup" sound. 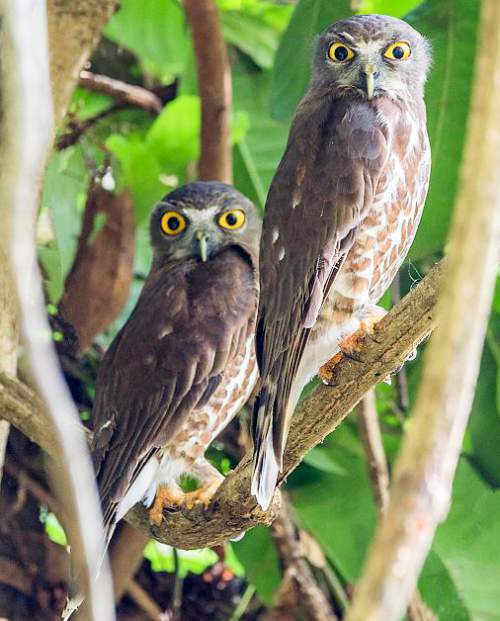 The brown hawk-owls are distributed in India, Sri Lanka, Nepal, Bhutan, Bangladesh, Myanmar, Thailand, Cambodia, Laos, Vietnam, China, Hong Kong, Malaysia, Singapore, Brunei, Indonesia and Philippines. The brown hawk-owl nominate subspecies N. s. scutulata is distributed in southern Malay Peninsula and Indonesia (Riau Archipelago, Sumatra and Bangka islands). The subspecies N. s. javanensis is distributed in western Java (Indonesia). The hawk-owl subspecies N. s. borneensis is distributed in Borneo (Malaysia, Brunei, Indonesia) and north Natuna Islands (Indonesia). The subspecies N. s. palawanensis is distributed in Palawan Island (Philippines). 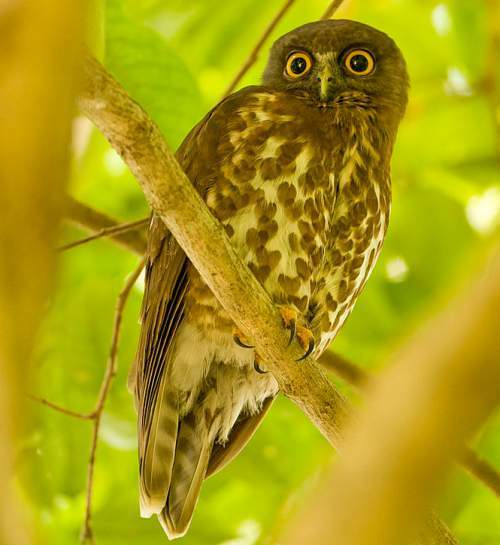 The brown hawk-owl subspecies N. s. rexpimenti is distributed in Nicobar Islands (India). The subspecies N. s. isolata is distribute in Car Nicobar Island (India). The subspecies N. s. hirsuta is distributed in southern India and Sri Lanka. The hawk-owl subspecies N. s. lugubris is distributed in northern and central India, including west Assam. The subspecies N. s. burmanica occurs in northeast India, Myanmar, Thailand, northern Malaysia, Cambodia, Laos, Vietnam, southern China and Hong Kong. These brown hawk-owl species have moderate forest dependence. They normally occur in altitudes from 0 to 1500 meters. The artificial ecosystems and habitats of these species include rural gardens, pasturelands, agricultural fields, plantations and urban areas. The natural ecosystems and habitats of these hawk-owl species include tropical and subtropical moist lowland forests, foothill forests, primary lowland rainforests, tropical and subtropical moist mangroves, scrublands and dry shrublands. The diet of this brown hawk-owl consists mainly of insects. Large insects, small mammals, birds, frogs and lizards are their primary food. These species are highly nocturnal. The breeding season of these hawk-owls is from March to June in India. The laying season is during March and April in Sumatra. These species are monogamous. They nest in tree holes and the clutch contains three to five white eggs. These hawk-owl species are non-migratory resident birds. They disperse locally after breeding. The populations in higher altitudes descend to the lower levels during winter. Post breeding, the juvenile hawk-owls may disperse and establish in new locations within the range. Within their range they may make local movements for feeding and breeding. The global population size of the brown hawk-owl (Ninox scutulata) has not been quantified. The overall population trend of the species is considered to be decreasing. In most of its range, this hawk-owl species is reported to be common to uncommon. The generation length is 4.1 years. Its distribution size is about 15,300,000 sq.km. Habitat alteration and destruction, deforestation, hunting for food and capture of adults and juveniles for pet-trade are the main threats that are endangering the survival of these hawk-owl species. The brown hawk-owl (Ninox scutulata) does not approach the thresholds for being Vulnerable, either under the range size criterion, or under the population trend criterion or under the population size criterion. The CITES (Convention on International Trade in Endangered Species of Wild Fauna and Flora) status is ‘Not Evaluated’ for the brown hawk-owl (Ninox scutulata). The brown hawk-owl (Ninox scutulata) is closely related to the northern boobook (Ninox japonica), chocolate boobook (Ninox randi) and Hume's hawk-owl (Ninox obscura). 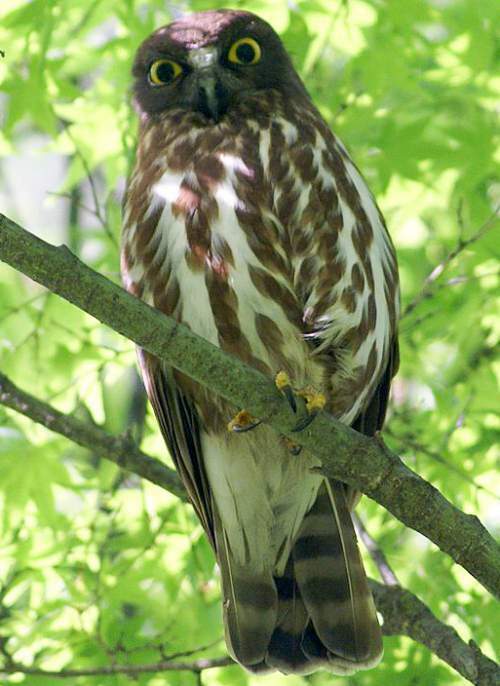 Current topic in Birds of India: Brown hawk-owl (Brown boobook) - Ninox scutulata.